FELISCRATCH lets cats scratch without destroying their owner’s furniture. been frustrated by the damage caused by their feline friends’ scratching. Now veterinarians have a new solution to help cats scratch in places which won’t drive their owner crazy--preventing the request for declaw procedures, improving feline welfare and cutting down on cat relinquishments. 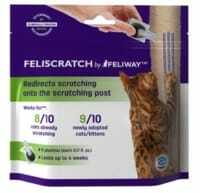 The new, one-of-a-kind product, FELISCRATCH by FELIWAY™, is clinically proven to stop and prevent both vertical and horizontal destructive scratching in the home. 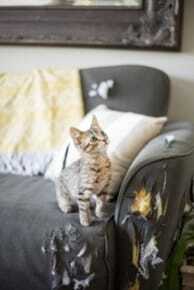 It does this by redirecting the cat to scratch his or her scratching post—not the couches and curtains. In clinical studies, FELISCRATCH® attracted more than 80 percent of cats to use their scratching posts within the first week of use. More than 90 percent of cats never started destructive scratching when adopted into a new home using FELISCRATCH®. 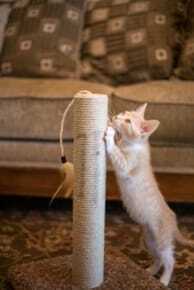 Cat scratching is a natural behavior which fulfills both physical and emotional needs. Cats scratch to stretch their bodies, to maintain their hunting and climbing skills, to groom their claws and to mark their territory, showing they’re in a safe space. Because few effective alternatives were available, veterinarians and pet owners have long believed declawing is the only quick fix for unwanted scratching, but the procedure is rarely medically necessary and can be associated with serious, painful complications1. Declawing is now illegal in several U.S. cities, including San Francisco and Los Angeles. Several veterinary organizations agree—The American Association of Feline Practitioners (AAFP) is the latest group to take a stand, joining the American Animal Hospital Association (AAHA) in strongly opposing declawing as an elective procedure. “Scratching is a normal feline behavior. It is veterinarian’s obligation to provide cat caregivers with education on normal scratching behaviors and options for cats to exhibit appropriate scratching behavior in the home,” states Heather O’Steen, AAFP’s Chief Executive Officer. FELISCRATCH® is produced by the makers of FELIWAY®, the number one behavior brand used and recommended by veterinarians. Each package comes with nine individual applications of the pheromone which are used as directed over the course of a month. With most cats, only one month of treatment is needed to transfer scratching from the area where damage is occurring onto a more appropriate spot.